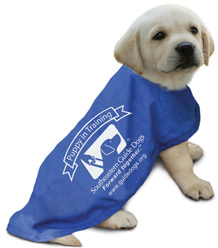 Diamonds On Main Jewelry is proud to partner with Southeastern Guide Dogs. blinded or wounded while fighting to preserve our freedoms. Our Military customers are #1 in our hearts. We thank our loyal customers and friends who support us, who in turn help us to support this worthy cause. To find out more about Paws for Patriots, go to www.guidedogs.org or click below.